‘Simply the Best’ is an understatement for Nereus LPG alarms & LPG control systems with their unique waterproof LPG sensors & many advanced features & a range of products to suit small vessels to larger MCA coded vessels requiring multi function detection. The choice of sensors includes LPG, petrol vapour, carbon monoxide, bilge water & heat/smoke. Marine Systems Engineering has a close relationship with Nereus Alarms going back many years & continue to be involved in their product development. Southampton Calor Gas has a long established leisure marine section with a large range of marine LPG equipment & marine appliances. They have experienced staff to help with all aspects of marine LPG inquiries. 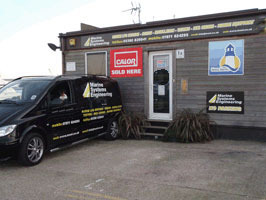 We have been involved with Southampton Calor Gas for many years assisting with technical problems, marine appliance servicing & have been involved with their Southampton Boat Show stand for 7 years. As our roots are in marine engineering, we can offer an innovative approach to design & installation of LPG systems for both the private boat owners & marine trade customers alike. Our staff have many years of ocean sailing experience which enables us to provide systems that are both practical to use & will cope with LPG requirements whilst overseas. We strive to source marine LPG equipment that stands up to the harsh marine environments & have features that really work from companies such as Nereus Gas Alarms, Gas Boat regulators, Aquafax & Southampton Calor Gas. The company premises at Ocean Quay has a well equipped workshop facility for marine cooker servicing, system constructions & an Echstein press for the assembly of any type of LPG hoses with stainless steel ferrules. Over the years, we have been involved in projects as diverse as the super yacht ‘Mirabella V’ & the classic ‘Altair’ to production installations for Discovery yachts & the Sadler 290. We have had a long involvement with the MCA assisting them with the LPG section of the Harmonised Code Of practice.